Everyone loves a great bag, whether it’s a trendy backpack, a practical shopper, or a fabulous handbag. 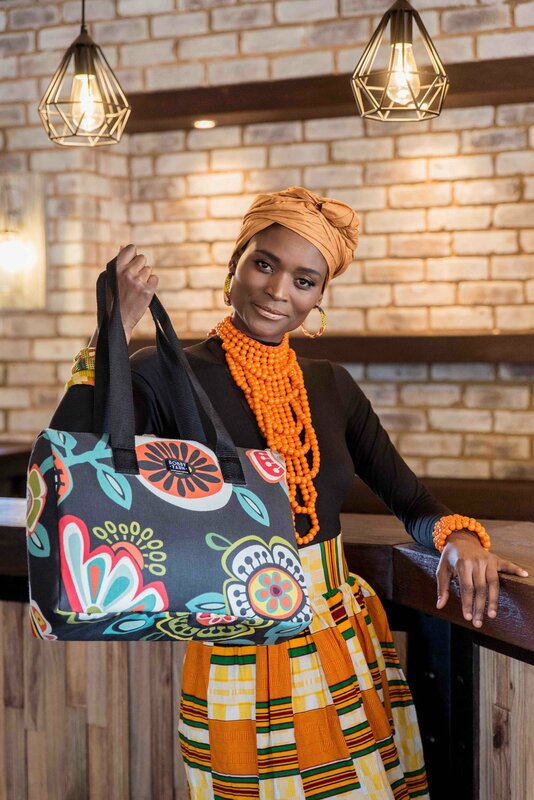 For Antoinette Stoltz, founder of accessories company Bobby Yarn, her design inspiration comes from African nature and culture, and her fabrics are beautifully appealing to the eye and to the discerning buyer. LoA chatted to founder Antoinette Stoltz this month to find out more…. Bobby Yarn manufactures and designs beautiful, bespoke and unique handcrafted bags. We use proudly South African material to line our bags and use local material produced in South Africa. We make a variety of bags, tote bags, beach bags, shopper bags, sling bags, vanity bags, purses, backpacks, and we have a great kids range of bags. We are a proudly South African company based in Johannesburg, Northcliff. Bobby Yarn caters for both our local and International clients. I was retrenched about 2.5 years ago and when I was 7 months pregnant. I started sewing lessons as a hobby once my last born was born in January 2016. I made a few clothing items but for the love of bags, and being a bagaholic, I decided to make my own bags. My bag stock was piling up on the dining room table when one day my husband posted on Facebook and asked if anyone would like to order one. That evening I received an order for about 10 bags as a friend was sending them over to Australia as proudly South African gifts, and this is when I decided to make a commercial range of proudly manufactured and designed South African bags. Bobby Yarn bags are made locally, using local materials. Our bags are light in weight, bright in colour, and we mix and match our proudly South African fabrics. Our bags represent our country. Our people love them, they are easy to fold up and take with you when you travel. They are well priced and well made. We are a NEWBEE proudly South African brand and our bags are lovely for gifts too. Our team at Bobby Yarn consists of myself, Antoinette (owner), and my amazing, supportive and helpful husband Jason. I have one seamstress at the moment and I also outsource to a level 1 BEE manufacturing company. I have several Agents that sell for me and I target Mommies or anyone that needs extra money. The most satisfying feeling is being able to be me, being able to love what I do and to be able to be flexible with you, my family, and my business - this is called balance! B A L A N C E is the key word! I simply Love my Family and I Love what I do! Who knew the 40's midlife crisis journey would be filled with so much excitement but yet so challenging. The biggest piece of advice I can give to other women is: When the times are tough, the tears are real, the nights are long, and the path is challenging - DO NOT GIVE UP! Put your head down, focus and carry on with your amazing journey you have been given. Think of the good things, the good times, and the first step you made to get to where you are now. The other piece of advice I can give is, it is imperative to have someone supportive, someone that encourages YOU, someone that believes in YOU and YOUR business/brand, and most of all YOU are the one who determines your future. Stay positive and no matter what, DO NOT GIVE UP! Follow and persevere with your dreams!